In a grudge match, Vernon Paris, 23 year-old of Detroit, Michigan, remained undefeated with a 7th round technical knockout over Tim Coleman, 27 years-old from Baltimore, Maryland, in the main event of ESPN Friday Night Fights. “The Pitbull” Coleman dropped “The Iceman” Paris in round two, but Paris got up quickly and went back on the attack and put Coleman down twice with body shots in round six. Paris continued his body attack in the seventh, putting Coleman down again. The referee Dan Steel prompting an end to the fight at 0:27 of the 7th round. By the end of the third, Paris was bleeding from his nose and suffered a minor cut above his left eye. 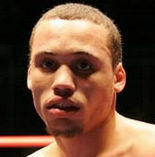 Unbeaten Paris stipped the USBA jr.welterweight belt and raised hid ledger to 25 wins (15 KOs) ed 3 no-contest. Coleman fell to 19-2-1 (5 KOs). The match between undefeated Art Hovhannesyan, 29 years-old from Armenia based in California, and former IBF 126-lbs champion Cristobal Cruz, 34 years-old from Mexico, ended in a four round technical draw. “Lionheart” Hovhannesyan, 14-0-2 (8 KOs), escaped with his undefeated record after an accidental headbutt opened up a nasty gash on the forehead of “Lacandon” Cruz, 39-12-3 (23 KOs). After the cut, the fight would go to the scorecard with scores of 39-37 (Gwen Adair for Hovhannesyan), 39-37 (Ray Corona for Cruz) and 38-38 of third judge Max DeLuca. In other actions, lightweight Michael Faragon and featherweight cuban Luis Franco remained unbeaten making quick work of their opponents. Faragon, 16-0-0 (7 KOs), scored a nice second round TKO over Ira Terry, 24-6-0 (14 KOs), when referee stopped the fights at 2:23. Franco, 10-0-0 (6 KOs), stopped mexican Adolfo Landeros, 21-21-2 (10), at the end of the round four. Landeros’ corner advised referee to stop the fight. Vernon Paris stopped Tim Coleman with the third of three vicious body shots 27 seconds into the seventh round of a scheduled 10-round junior welterweight bout Friday in Santa Ynez, Calif., on ESPN2. Paris put Coleman down twice in the sixth round with lefts to the stomach, sending Coleman to his corner in pain at the end of the round. The winner then landed one more left to the gut, which forced Coleman to take a knee. The referee stepped in at that point and ended the fight. The fighters engaged in unusually vicious trash talking before the fight, which seemed to motivate Paris (25-0, 15 knockouts). Paris stops Coleman with a blistering body attack on ESPN!